Issues are added into Project Insight as items from the Issue selection in the Add drop-down menu. You may choose to display Issues assigned to you on the Dashboard, see Dashboard Components. 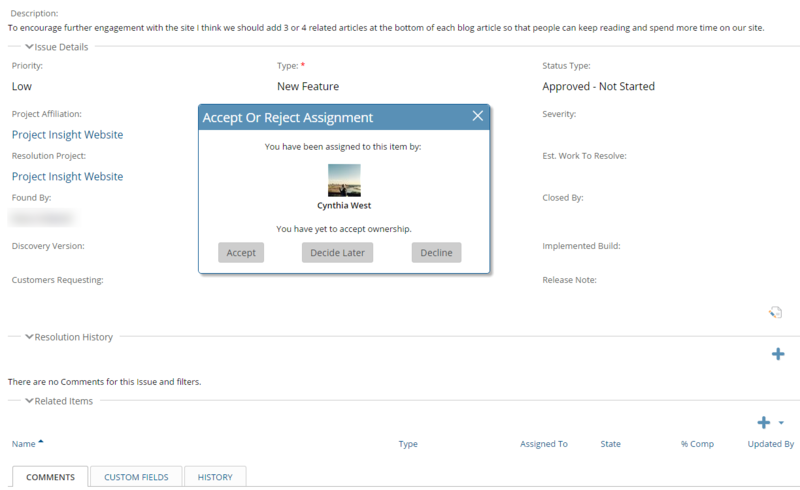 Upon first opening an existing Issue assigned to you, you will see the detailed Issue display with an ownership acceptance prompt. Upon acceptance of the issue, you may proceed to update information in the Issue Management, Resolution History and Comment History sections. Further information on issues is described in the Issues section, starting with the Issue Overview.